7 years & up. 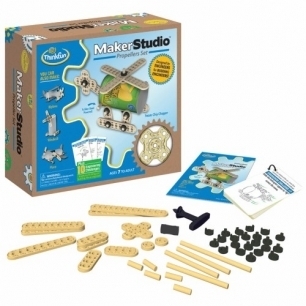 Maker Studio is a new kind of construction toy-free-form and open-minded to help stimulate your little Maker's creativity. We supply all the engineering parts: gears, wheels, and frames. It's up to your creative kid to supply the imagination. The instruction manual includes detailed assembly diagrams for four different machine builds. You also get 10 open-ended engineering challenges. The purpose of these challenges are to stimulate open-minded creativity wrapped around a specific assignment. Plus, it's fun for Makers of all ages!